High hopes but those of the host nation in the Women’s Doubles event at the Seamaster 2018 ITTF World Tour Lion Japan Open in Kitakyushu ended on the evening of Friday 8th June. Hina Hayata and Mima Ito, the one Japanese partnership to reach the quarter-final round departed proceedings. The top seeds, the winners on the ITTF World Tour in 2014 in Magdeburg, also in 2017 in Olomouc and Stockholm, before succeeding earlier this year in Bremen, experienced defeat at the hands of a partnership that does not possess the same record of success but is most formidable and could well be considered favourites for gold. They were beaten by China’s Liu Shiwen and Wang Manyu, the no.6 seeds, in a contest in which the Japanese teenagers more than underlined their quality. They were beaten by the very narrowest of five games margins (5-11, 13-1, 9-11, 11-9, 11-9). 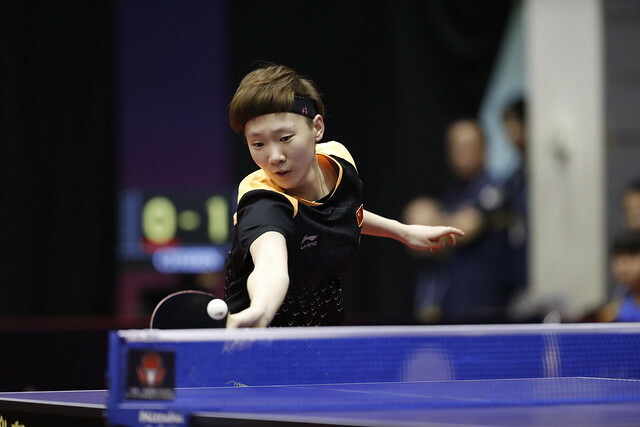 Success for Liu Shiwen and Wang Manyu contrary to seeding, it was the same for colleagues, Gu Yuting and Mu Zi; not seeded, they ousted the European combination of Slovakia’s Barbora Balazova and the Czech Republic’s Hana Matelova. Similarly, it was a close call; the Chinese duo needed the full five games to secure victory (10-12, 11-2, 13-15, 11-2, 11-7). Noteworthy efforts from Chinese partnerships but the outfit to catch the eye was that of Chinese Taipei’s Cheng Hsien-Tu and Liu Hsing-Yin. Like Gu Yuting and Mu Zi, not seeded, they ended the hopes of Hong Kong’s Ng Wing Nam and Minnie Soo Wai Yam, the no.5 seeds. Furthermore, like their illustrious Chinese counterparts they needed the full five games to secure victory (11-4, 8-11, 11-13, 11-9, 11-5). Wins contrary to seeding, in the one remaining Women’s Doubles quarter-final contest, it was as per status; Korea Republic’s Jeon Jihee and Yang Haeun, the no.4 seeds, ended the hopes of Romania’s Elizabeta Samara and Bernadette Szocs, the no.8 seeds (11-6, 7-11. 13-11, 11-3). In the penultimate round, Liu Shiwen and Wang Manyu meet Jeon Jihee and Yang Haeun; Cheng Hsien-Tzu and Liu Hsing-Yin oppose Gu Yuting and Mu Zi. The semi-finals are scheduled for the morning of Saturday 9th June.